You already know that I live in a house full of boys. Last night I went into Target to grab a pack of paper towels and I came out with 2 inflatable lightsabers. I will probably be returning today to pick up a third one so that my husband doesn’t feel left out. Sometimes I just need to buy something pink or frilly to remind myself that I’m a girl. I grew up with brothers, I have sons, and my husband has a brother. Thankfully his brother is married now; I just love my sister-in-law. She is super crafty and makes me pretty notes and cards. 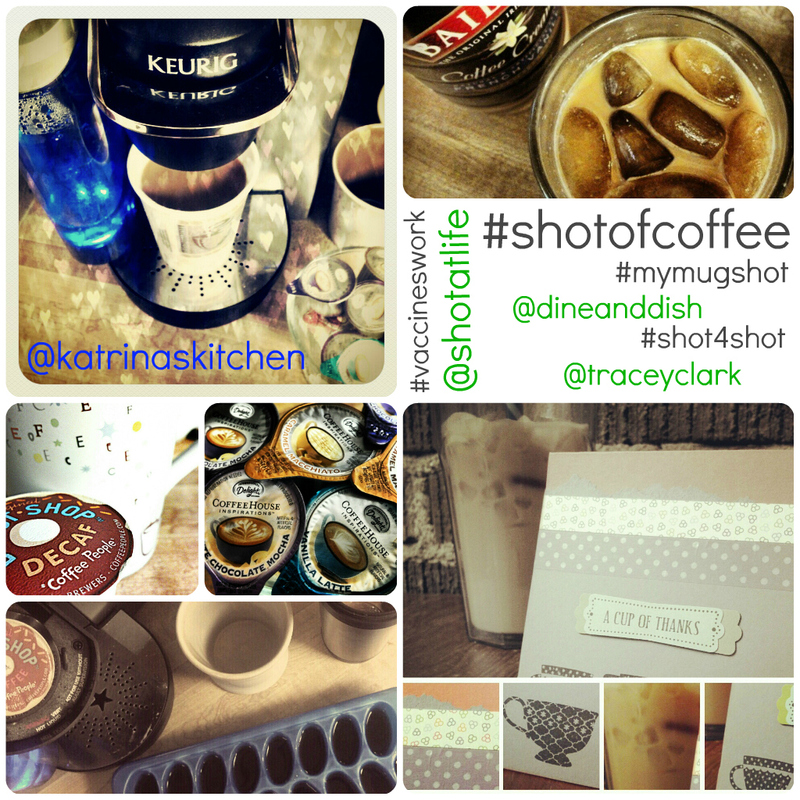 One of her creations even showed up in my Instagram #shotofcoffee pictures this week. This is a fun post because my internet friends and my real life friends came together for the love of coffee and also for a great cause. Head over to Dine and Dish or traceyclarkblogs to find out how snapping a picture of your coffee can make a difference in the [email protected] campaign. 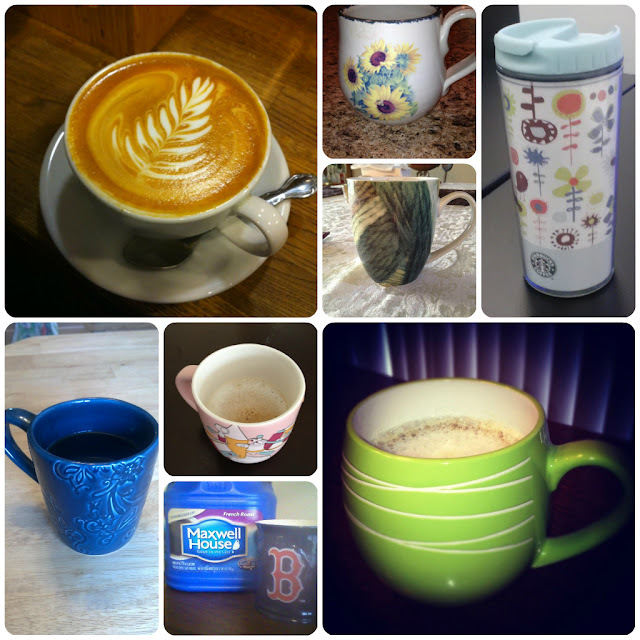 Since schedules can be a little crazy I wasn’t able to get my friends together this week for coffee and cake but we did have a little virtual coffee party and they all sent me pictures of their favorite mugs. I just love the variety! Don’t I just have the greatest friends? I know that I’m a bit odd for taking pictures of my food all day but they were good sports and played along. In a medium bowl, sprinkle yeast and a pinch of granulated sugar over the warm milk. Let stand until foamy, about 5 minutes. Whisk together the remaining ¼ cup plus 2 tablespoons granulated sugar, the whole egg and the egg yolk. Add to yeast mixture, combining gently. In the bowl of your stand mixer, combine the flour and salt. Add the egg/yeast mixture and beat on low speed about 30 seconds. Switch to the dough hook attachment. Add 1 stick butter and beat until smooth and soft, about 10 minutes (dough will be sticky). Butter a large bowl or spray with vegetable oil. Turn out dough onto floured surface; knead a few times until smooth. Place in the buttered bowl and cover with plastic wrap. Let stand in a warm place until doubled in volume, 1 to 1½ hours. Combine the chocolate, granulated sugar, and cinnamon. Cut in butter with a pastry cutter or rub in with your fingers until combined. Punch down dough. Transfer to a lightly floured work surface. Let the dough rest for 5 minutes. Roll out the dough to an 18-inch square. Brush the edges of the dough with egg wash. Spread filling over dough, reserving ½ cup for the topping. Tightly roll dough like a jellyroll. Pinch seam to seal, and fold in half to bring ends together to form a U. Twist two or three times to “braid”. Butter or oil a loaf pan or line with parchment paper. Transfer dough to loaf pan and brush top with egg wash. Combine the powdered sugar, flour, and butter with your fingers until crumbly. Sprinkle crumb topping plus the reserved ½-cup chocolate filling over loaf. Preheat oven to 350° F. Drape plastic wrap over dough. Let stand in a warm place until raised by half, 20 to 30 minutes. Remove plastic wrap and bake, rotating loaf pan halfway through baking, until golden, about 1 hour. Transfer loaf pan to a wire rack. Let cake cool completely before cutting. Wow, that coffee cake sounds and looks fabulous! Mmm, I heart yeasted coffee cake SO MUCH. I haven't made one in forever – adding this to my "to-do" list! That looks like perfect coffee cake. Anything with dark chocolate in it is going to be a hit! P.S. I have two sisters and all aunts–come hang out with all of us girls! I hear ya' about needing more girls in your life. I am surrounded by boys at all time. Just wait until yours get a little older and they side with their dad and gang up on you! My favourite thing about this cake, besides that it's infused with chocolate is how dense it looks 🙂 – – delicious!! Of course, doesn't everyone walk out with lightsabers? =) LOVE this cake!! Loooooove coffee cake. Loooooove chocolate. Score! Do you think I could cut the risen dough in half and make two cakes? That way there would be 2 (uh, yeah) and it would be less doughy and possibly really moist. What do you think? These look amazing!! I want that whole loaf! Good Golly! This looks so good! 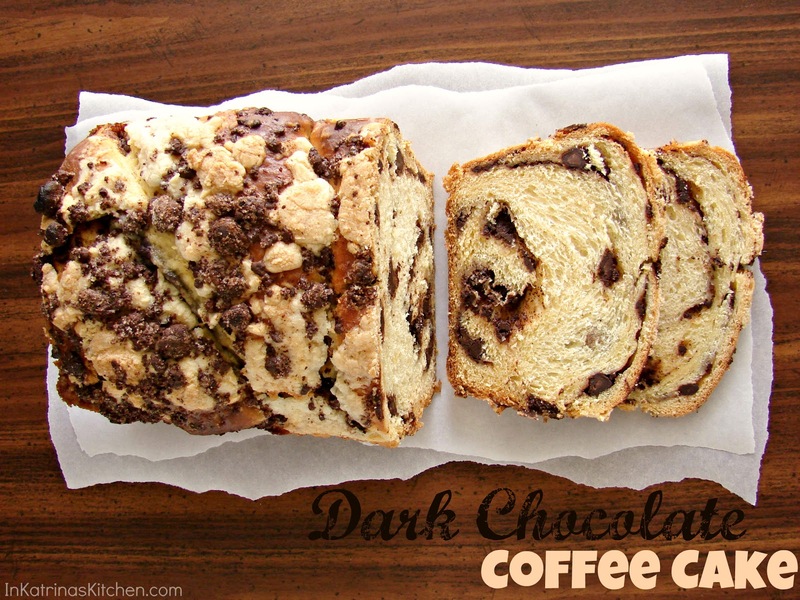 Do you know if there is much difference between this and Babka? 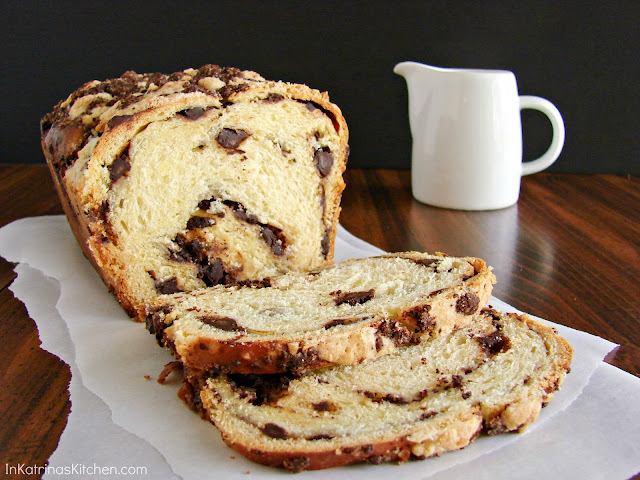 I want to try my hand at Chocolate Babka but this looks just as yummy! Oh this is totally my kind of cake! What a gorgeous gorgeous loaf Katrina. I don't do a lot of coffee but I love your chocolate coffee cake! This looks amazing! I've been wanting to make this for so long and you have absolutely sealed the deal! Thanks for sharing! Que recetas más deliciosas, ricas y apetitosas! Katrina, this coffee cake looks fantastic! Love you use of dark chocolate, cinnamon and a crumbly topping. This would make for one mouthwatering morning meal! I love coffee cake! I shared your link on my Friday favorites. Yummy! I enjoyed all the photographs. Have a great weekend. My boys would adore this, too! Who wouldn't like chocolate for breakfast??? YUM. You are so awesome!! I love love love that you did this… thanks, friend! Oh my gosh that coffee cake looks killer! I want some! awesome!!!!!!!!!!! thank you so much for your support! Just found you at Rachel Cooks. This looks delish! Katrina, this looks fantastic! Definitely wouldn't last long in my house! I have always had a weakness for a good dark chocolate cake. My husband said this is the best chocolate cake he has ever had and t is by far the easiest and best tasting cake I've ever made. Icing or frosting is the creamy topping added to baked goods, such as cakes and cupcakes for decorating purposes. What. clothing needs, tattooists and body piercers. Is it me or I didnt see coffee in the ingredients, Im confused cause its called coffee cake after all. Sorry. No coffee in the cake! But that’s a great question. It’s a cake to be enjoyed with coffee in the morning. hi just wanted to make sure this coffee cake doesn’t actually contain coffee is that right? Correct- thank you for asking. 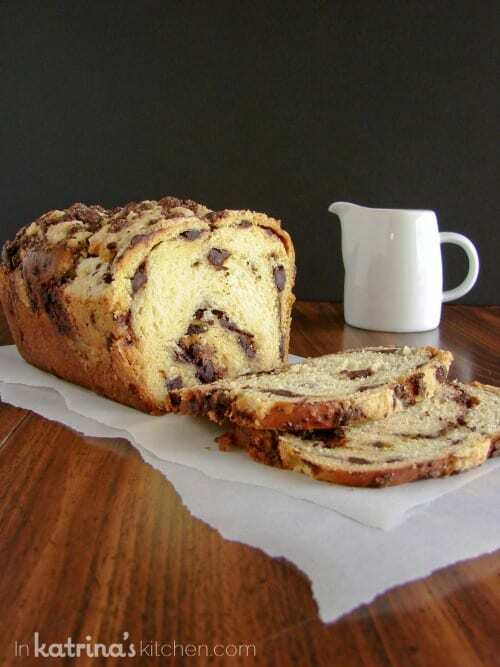 Coffee cake is traditionally a cake that can be enjoyed with coffee.